#artlife can look pretty glamorous on instagram. To bring us all back down to earth here's a list of things I found myself doing while deinstalling Archival Alchemy. Fight with a Lyft driver about how to best tessellate 12 boxes (all differently sized of course) in the trunk of his car. 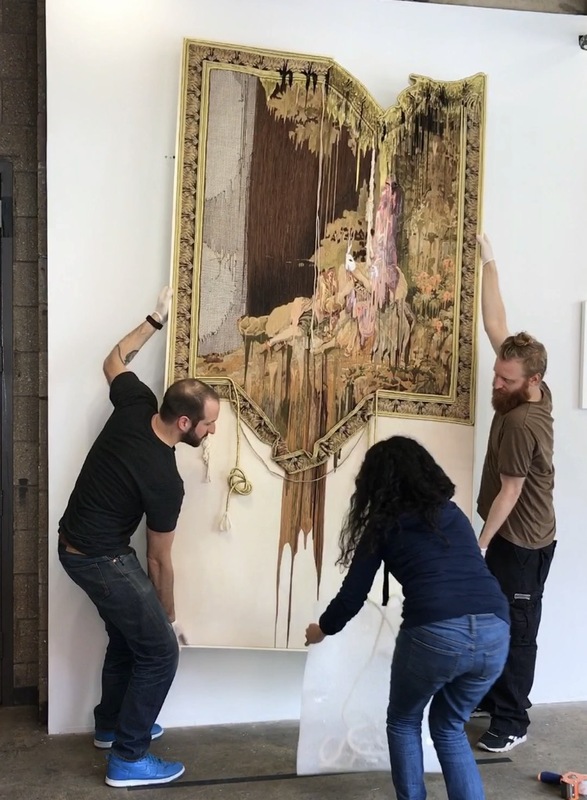 The beginning of the end - art handlers extraordinaires Steven Paneccasio, Sol Erez, & Ambika Trasi take down Marium Agha's A Courtier in Love - A Two Dimensional Portrait (while I make a video). Speedy removal of wall text thanks to a scraper blade. Yours truly ripping up floor tiles. #blessed. Golnar Adili deinstalling her sculpture A Spatial Study of Ye Harvest from the Eleven-Page Letter.